In our final quarterly letter of 2017, we noted, "The S&P 500 Index was up 19% in 2017, and the MSCI EAFE Index, which measures the major international equity markets, was up 25% (as of 12/31/2017)." Roll forward 12 short months and the story was much different, with the S&P 500 Index down 4.4% in 2018, declining 9.0% in December alone. U.S. markets experiencedone of the worst Decembers since the Great Depression. International markets did not fare any better in 2018, with the MSCI EAFE Index off 13.8% and the MSCI Emerging Markets Index down 14.6%. While none of this may be news to you, we reference it to reiterate the points we made a year ago and have been making for the past several years. The current market volatility, and resulting declines, are no surprise to us considering how extended valuations have been--especially in the U.S. market. How should investors navigate the current volatility and market uncertainty? Our answer is the same today as it was a year ago--and essentially the same as it has been for more than 40 years: Try to look beyond current market conditions and take a long-term view--of at least five years. A long-term mindset also means considering valuations and rebalancing to a normal asset-allocation model. At the end of 2017, many investors may have allowed their asset allocations to get out of balance and may have, among other things, been over-allocated to the U.S. market, especially to technology companies, and under-allocated to non-U.S. markets. 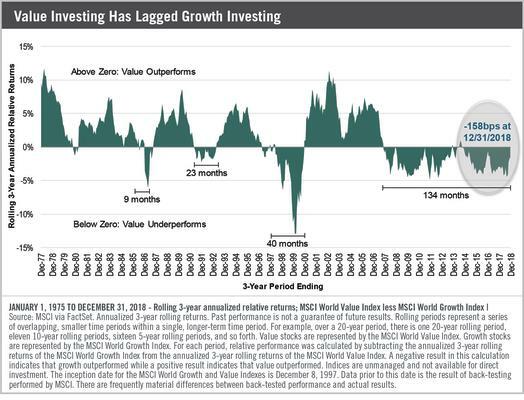 The past 10 years have been very difficult for value investing, with the broad value index (the MSCI World Value Index) underperforming its growth counterpart (the MSCI World Growth Index) for more than 130 months--the longest such period on record, as shown in Exhibit 1. It's likely that when we look back on this period it may be known as the nuclear winter for value investing. In light of current valuation discrepancies, we'd like to draw your attention to a November 2018 research paper from Brandes Institute Advisory Board member Wim Antoons titled "The CAPE Ratio and Future Returns: A Note on Market Timing." In the paper, Wim notes that as of June 30, 2018, the Shiller cyclically adjusted price earnings (CAPE) ratio for the S&P 500 stood at 32, an unusually high level. 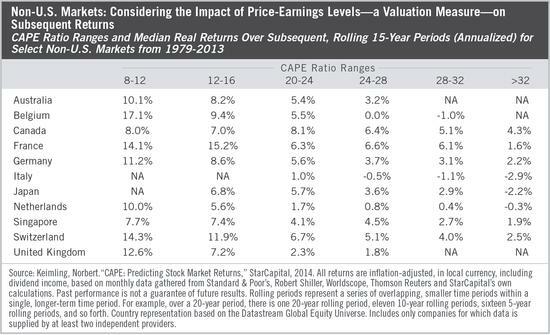 He points out that, "historically, high CAPE ratios generally have been followed by low returns in the subsequent 5- and 10-year periods and that low CAPE ratios generally have been followed by strong returns over subsequent 5- and 10-year periods." "Today, many global equity funds have underperformed the MSCI World Index for an extended period. The U.S. market accounts for 60.7% of the MSCI World Index as of June 30, 2018. In my opinion, a global approach to equities should be more diversified. I believe it makes sense to diversify toward emerging markets, Europe and Asia. Although one cannot predict short-term equity market results, the high valuation of Japanese equities in 1989 and the high weight for them at that point in the MSCI World Index could serve as a warning today for the United States. Wise investors invest worldwide, not based on index weight, but based on valuation and earnings growth. To me, it definitely makes sense as a global investor to underweight U.S. stocks now based on valuation and overweight other regions. I believe the spread between value and growth stocks is, from a historic point of view, very high. The high CAPE currently is (mostly) related to the technology sector where investors have chased high-growth companies at high price levels. Active management focused on the careful selection of well-managed and reasonably priced companies still makes sense in this expensive market and, I believe, will make a large difference for patient investors in the future." The MSCI information may only be used for your internal use, may not be reproduced or redisseminated in any form and may not be used as a basis for or a component of any financial instruments or products or indices. None of the MSCI information is intended to constitute investment advice or a recommendation to make (or retrain from making) any kind of investment decision and may not be relied on as such. Historical data and analysis should not be taken as an indication or guarantee of any future performance analysis, forecast or prediction. The MSCI information is provided on an "as is" basis and the user of this information assumes the entire risk or any uses made of this information. MSCI, each of its affiliates and each other person involved in or related to compiling, computing or creating any MSCI information (collectively, the "MSCI Parties") expressly disclaims all warranties (including without limitations, any warranties of originality, accuracy, completeness, timeliness, non-infringement, merchantability and fitness for a particular purpose) with respect to this information. Without limiting any of the foregoing, in no event shall any MSCI Party have any liability for any direct, indirect, special, incidental, punitive, consequential (including, without limitation, lost profits) or any other damages (www.msci.com). Wim Antoons' opinions do not necessarily reflect the views of Brandes Investment Partners. The information provided in this material should not be considered a recommendation to purchase or sell any particular security. It should not be assumed that any security transactions, holdings or sectors discussed were or will be profitable, or that the investment recommendations or decisions we make in the future will be profitable or will equal the investment performance discussed herein. Strategies discussed are subject to change at any time by the investment manager in its discretion due to market conditions or opportunities. The Brandes investment approach tends to result in portfolios that are materially different than their benchmarks with regard to characteristics such as risk, volatility, diversification, and concentration. Market conditions may impact performance. International and emerging markets investing is subject to certain risks such as currency fluctuation and social and political changes; such risks may result in greater share price volatility. One cannot invest directly in an index. Past performance is not a guarantee of future results. The foregoing reflects the thoughts and opinions of Brandes Investment Partners(R) exclusively and is subject to change without notice. Brandes Investment Partners(R) is a registered trademark of Brandes Investment Partners, L.P. in the United States and Canada.